Garab Dorje, (Skt. Prahevajra), was the first human master of the Vajrayana teachings of the Great Perfection (Tib. Dzogpa Chenpo), which he received directly from the Sambhogakaya Vajrasattva. Beginning with Garab Dorje, and down through the master Padmasambhava, the teachings were transmitted through the Symbolic Transmission of the Vidyadharas. Garab Dorje was born in the region of Dhanakosha in the land of Oddiyana. His mother, the princess of Oddiyana, was a fully ordained nun, who received a miraculous vision in a dream whereby she was given empowerment by a crystal vase marked by the five syllables. Later, she gave birth to an emanation of Vajrasattva, but because the baby had no father, she cast him into a pit of ashes, from which came sounds, lights and a shower of blossoms. Three days later, she went back to the pit, and finding him unharmed, she bathed him. Gods and Dakinis appeared in the sky and made offerings to him. Later, at age seven, he debated with 500 scholars in King Uparaja's court, and, after being acknowledged as a Nirmanakaya emanation, the King named him Garab Dorje, Infinite, Indestructible Joy. Garab Dorje went to live on the mountain of Nyima Nanje, home to fierce Preta spirits, where he stayed in retreat for 32 years. As a result of his practice, his body became brilliant and translucent, like a ray of sunlight. It is said that the 6,400,000 verses of Dzogpachenpo and vast numbers of tantra teachings were primoridally present in Garab Dorje's mind. 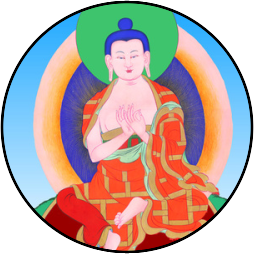 He had a direct vision of Vajrasattva, where he was given empowerment based on rays of light. Vajrasattva permitted him to commit the tantras to writing, and to arrange them into volumes. Later, in the charnel ground of Shitavana, he taught the dharma to dakinis, and hundreds and thousands of them attained the state of rainbow body. He later transmitted the teachings on the Secret Mantrayana to his disciple Manjushrimitra.